Have you ever wondered watching a movie at home with a great cinematic experience? Well, now you can have this feeling and experience just being at your house. The in-wall speakers of this year have become so advanced that they can fulfill all your needs of a good quality stereo sound system. They even require no extra space in your living room; they are so invisible and easily fits into the wall disturbing no other things. We know that you are so confused about what to buy and what features you should see when buying an in-wall speaker. But relax and take a deep breath, we have already solved your problem. Below in this buying guide, you will find out every perfect in-wall speaker with amazing features that you should know at the time of purchasing. So let’s have a look at some of the essential features or elements of the in-wall speakers you should see before buying one. How to Choose The Best In-wall Speakers? We have gathered some info for you about the qualities of an in-wall speaker. Keep these things in mind before buying it. Audio – As we are talking about the speakers, so audio is the main factor to see. Always focus on what type of audio does the speaker produce. The quality of the sound must be clear, distortion-free even at the high volume and it must be loud enough to reach every corner of the house. Design – The design or the body of the speaker must be slim. Check out the dimensions of the product, and the frame must be lightweight. Also, have a look at its cutout dimensions, you will get the idea about is height, depth, and width. The grilles should be paintable, so in case the best in-wall speakers do not match to your home décor, or you didn’t like the color of the speakers you can quickly paint its exterior and pair it with your wall color or room’s deco. Installation – The installation should be simple and straightforward which requires less time and fewer tools to fix the speakers into the wall. The rotating cams are also present which ensures that the installation is secure and vibration-free. Weatherproof – If you want to install the speaker outdoor or in bathroom, kitchen or sauna, you must go for the weatherproof or water-resistant speakers. You can install or connect these speakers outdoor in covered porches or near the pools or indoor where the environment is humid. It can perfectly tolerate the damp and wet climate. Safety – Always keep in mind to buy the set of the speaker which have the wires that are specially designed for the use of wall or ceilings. Budget – There is a vast range of speakers available online and in the markets with high prices. But we have gathered those speakers who have all the fantastic features of the expensive ones but at a little cost. So yes, you can get the best in-wall speakers at a low price. Decibel – It describes the loudness of a sound. The range of the decibel is written on every product. Crossover – It separates the frequencies. Frequency Response – Naturally, a human ear is capable of hearing a sound from 20 Hz – 20,000 Hz. So check out the level of frequencies of the speaker. Diaphragm – The moving part in the speaker is known as the diaphragm. Woofers have con-like membranes whereas tweeters have dome-shaped diaphragms. Impedance – It is the resistance power of the speaker given to the amplifier. The optimum rate of impedance must be 8 ohms. If the speakers possess 4 ohms or less, then you might get some problems in the speaker. Sensitivity – It is the efficiency of the speaker that how it converts the power into the volume. If the speaker has the ratings below 80% of sensitivity, then you should avoid to buy it. 2-way Speaker – This speaker possesses two drivers. They are good at low and high range sounds and not suitable for mid-range sound. 3-way Speaker – It has three drivers. One for small, one for mid and one for the upper range frequencies. Central Speaker – This speaker is usually fitted close to the TV or in the center of the room. This stylish looking circular in-wall speaker has a beautiful composition. Instead of a typical rectangular or square design of the speakers, they look unique and pretty fixed in your walls or ceilings. An excellent flush mount design with amazing features. 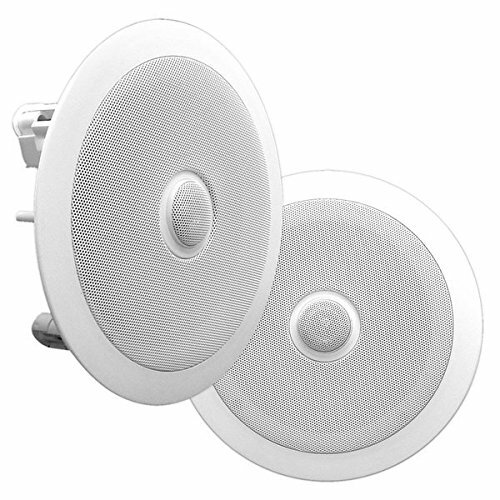 It can be installed easily into the perfect cutout walls according to the exact dimension of this attractive speaker depth of 2 ¾ inches and 7 7/8 inches of diameter. Pyle PDIC60 6.5 inches speaker has a smooth exterior finish. And the overall dimension of the speaker is about 9 inches in diameter and a depth of 2 ¾ inches. The item is light in weight – 5 pounds only. This circular speaker can be mounted in the walls as well the ceilings. Its Midbass speaker of 6.5 inches produces a stereo sound that reaches to every corner of your home and office. This adorable speaker’s 1-inch dome tweeter of Titanium can be quickly moved towards any direction in the room where you want it to get the best sound with high and mid frequencies. They deliver the outstanding loud music with it 250W of peak power which brings more fun and real-feel to your favorite movies or games. This in-wall speaker produces clear and loud music in a wide range. The impedance rating of the fantastic product is 4-8 ohm. It has the voice coils of high temperature and a frequency response of 65 Hz to 22000 Hz. The speaker comes with the hassle-free wire connection which is very convenient to connect. It is sold as a pair including two speakers. It has another unusual feature that everyone looks for when buying a perfect speaker and that is the affordable price. It is available on Amazon with a mind-blowing rate. So, go and order this beautiful and powerful in-wall speaker today! Micca M-8S is popular in the market and among the users with its outstanding 8 inches of a poly woofer and a 1-inch soft tweeter of dome shape. Tweeter and woofer work together efficiently through a crossover network of 12dB. A smooth and clear sound is delivered with strong bass output to enhance every note of the music and gives you goosebumps. This 2-way in-wall speaker has a secure installation system and can be colored to merge with the type of decoration. Mounting tabs that are already present into the system install it quickly, and you need only a screwdriver to fix it onto the wall. It is perfect for different kinds of audios whether you are listening to music, watching movies with your friends and family, playing games with a loud sound gives you the real feel of the game. The power handling capacity of this in-wall speaker is 100 watts for each speaker and a frequency response of 40 Hz to 20 kHz enough to enjoy the loud and distortion-free sound. The cutout dimensions of this speaker are 8.7 inches in width and 12.7 inches in height with a mounting depth of 3.4 inches. However, the aspects of the product itself are 10″ width and a height of 12.7″. The weight is also light same as the Pyle PDIC60 which is 5 pounds. The impedance rate is 8 ohms, and the sensitivity of the speaker is 90dB 1W/1M. The bass performance is good and works efficiently with all type of music. The bass will be enhanced and improved if you a reflective surface is added to its back. 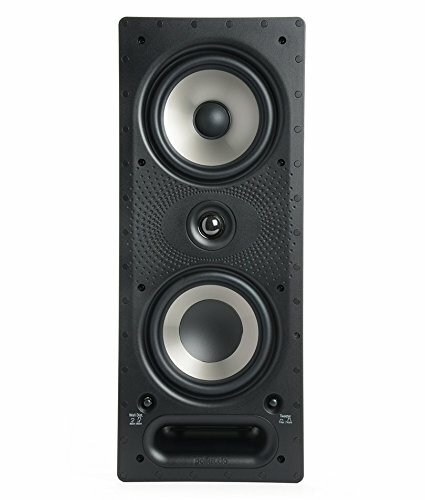 These speakers do not produce a distorted sound even at the high volume. The silk dome tweeters will always create a crisp sound that will make you to not just listen to the music, but you will feel it. It is also affordable and can be purchased from Amazon. This in-wall speaker is known for its best quality and crystal clear audio. The audible device comes with a feature of the deep bass system. It has 2 Mid-driver Woofers of 5.25 inches and dome tweeter of 1 inch; together they produce a clear and booming sound. The system also consists of a Polk’s Power Port technology. It is a 2-way in-wall center channel speaker with easy installation and mounting system and a rotating cam which helps in vibration-free installation. The outer surface of the speaker is paintable, and you can color it according to your wall. The dimension of the product is 9.8″ x 14.8″ x 9.3,” and it is installed in a horizontal position to produce a stereo sound. The cutouts are 13 1/8 inches wide and 7 5/8 inches in height with a mounting depth of 3 3/8 inches. The weight of the system is about 9 pounds. 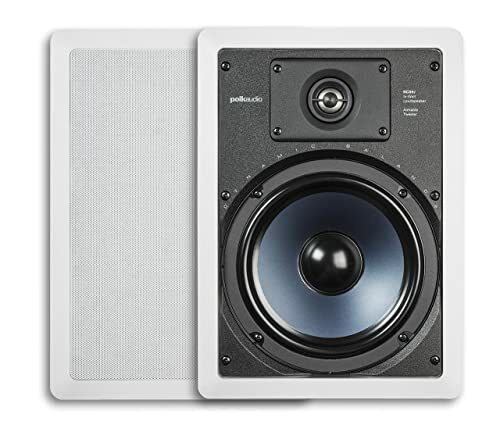 Polk Audio 255C-RT speaker has 50 Hz-25 kHz frequency response and a sensitivity of 90dB. It has an impedance rate of 8 ohms. It also has an option to attach an amplifier to enhance its sound double. The cones are durably made up of a compound polypropylene which keeps it flexible for a very long time, and it keeps on producing the best and clear sound. It is a highly recommended in-wall speaker; it is one of the best in-wall speakers. The reason behind the customer’s favorite choice is its amazing audio quality. There is no distortion in the sound even if you increase its volume and you will always get a smooth and clear sound in all genres. Another reason for its likeness by the customers is that it not too much pricey as the other systems of its type. It can be purchased through Amazon. 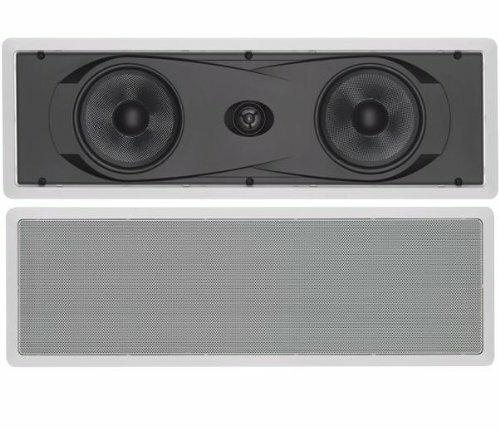 This model of Yamaha in-wall speaker has a wide-range of recommendations due to its best frequency response of 50 Hz – 24 kHz. It delivers a loud and stereo sound with dual cone woofers for producing a deep bass and a soft dome-shaped tweeter of 1 inch best for creating the crisp sound. The maximum power input of this in-wall speaker is 130 watts, and it can surround your entire colossal room with its pretty clear sound. The sensitivity of this speaker is 88dB. It adjusts so perfectly into the walls that it cannot be detected easily by anyone; it greatly matches with almost every kind of deco. It easily installs and mounts into the wall. The item is 23.5 x 7.7 x 3.2 inches in all dimensions. It also has the perfect lightweight of about 5.1 pounds. This elegant piece comes with a template of cardboard which helps in the exact and clean cutouts of the wall quickly. Due to its mid and high ranges, the dialogue deliveries in the movies or shows are heard so clear with no broken sound. It gives a perfect cinematic experience while watching the film, and you can also watch it with your 7.1 home theatres systems. Yamaha NS-IW760 comes with a 2-year warranty by Yamaha for each speaker. 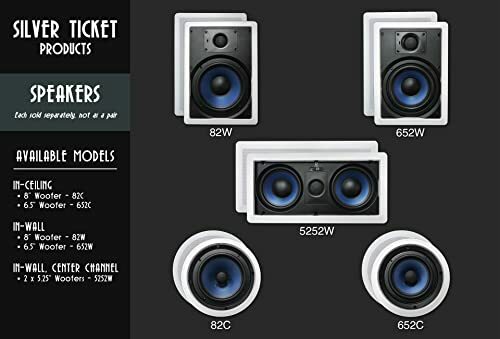 The greatest distance of these speakers must be 10 feet for the excellent sound quality and if you are mounting more than one speakers than the range must be at least 6 feet. It is also very affordable and can be purchased online from Amazon. This 2-way in-wall speaker is the best choice if you want to install it in the bathrooms, saunas or kitchen due to its incredible water resisting property. It has a solid construction that can easily withstand the moisture. It has the best power handling capacity and frequency response which make it the better among other of its types. The exterior of the speaker has a solid body and is a rectangularly shaped speaker. 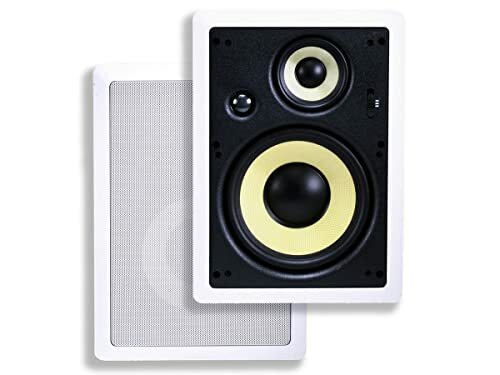 This 8-inch in-wall speaker can be used for various purposes and several devices like 5.1, 6.1 or 7.1 home theatres systems. The dimensions of the product include a height of 14.1 inches and width of 4.1 inches, and weight of the speaker is 7 pounds only. 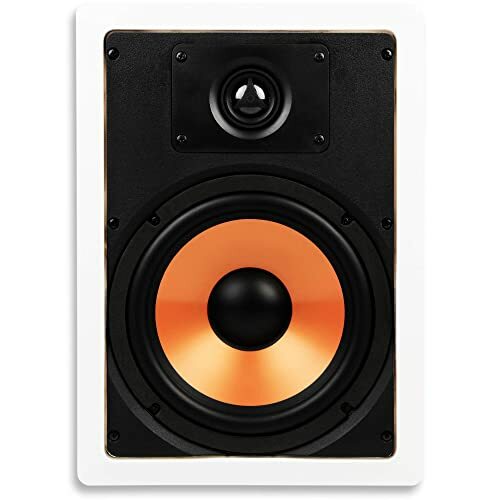 This 82W in-wall speaker consists of a driver of 8 inches and a dome tweeter of 1 inch. The domes can be rotated according to your seating direction. These silk dome tweeter pivots of 20mm are used for micro-tuning for the placement of the sound. The cones are covered with rubber which prevents them from deteriorating for a more extended period. And they are available usually with the grille of white color which does not make it prominent onto the walls. They are sold as an individual speaker, but if you want both right and left speakers, then you must go for a pair. The woofer cone is composed of injection-mold mica propylene that helps to produce high quality and loud sound bringing your movies and music into real-life. The excellent frequency response ranges from 51 Hz to 20 kHz, the sensitivity of 89+/-2dB, and the rate of impedance is 8 ohms. It can be installed in both ways vertically or horizontally. The speaker has a rapid and easy installation system due to the presence of the flip-levers. It just looks expensive, but actually, it is not. You can buy it from Amazon at a reasonable price. Polk Audio RC85i is known as the best in-wall speakers which can be used indoor in home and office as well as outdoor in covered porches. This speaker has this quality due to its excellent water-resistant variety. It can handle the humid weather outside and the damp conditions in your bathrooms and even the saunas. The exterior structure of the speaker is rectangular, the edges are slightly curved, and the grilles and the borders are white. This speaker comes with the templates to cut out the wall easily by tracing it. This product is straightforward to install, just cut the hole using the models, connect the wires, and fix the speaker with the help of the rotating cams which require no mess or support of other people. After its installation, it can be painted as per your choice. The dimensions of this speaker are 10.1 x 3.5 x 14.2 inches, and it weighs for about 5.5 pounds. It has a woofer of 8 inches producing a full bass, and a soft dome tweeter of 1 inch gives more detail and depth to the audio, and together these two deliver an incredibly loud sound which is audible to almost every room in your house. The speakers possess mineral-filled polymer cone and great compound driver baskets that help in creating the music with a broader range. The rubber seal prevents the moisture, and the speaker then becomes able to install in humid places like bathroom, kitchen and outdoor. RC85i is a great speaker for daily use. It produces a stereo sound which gives the perfect experience as you are watching the movie in the cinema. You can play the outstandingly clear and loud music in your parties. The tweeters are designed to deliver a clear sound in the high and midrange frequencies. Its features altogether make it the perfect speaker, so you buy it by all your heart, and you will not be disappointed. After installing it quickly, you sit relax and enjoy its incredibly loud and distortion-free music. It is affordable as compared to the other speakers with such amazing and multiple features. It is available on Amazon at a reasonable price. This speaker can be used in 3 ways and is known as the 3-way class speaker system. The speaker consists of a 90º x 90º square Tractrix horn with a Titanium diaphragm compression driver of 1 inch. It also has two Ceramically cone woofers of 5.25 inches. You can easily install it and can be mounted vertically as well as horizontally. Its horn-loaded technology enhances the acoustic output, and it reduces the distortion significantly. The speaker has a slim body, with the dimensions of 3.5 x 8 x 17.8 inches and a lighter body weight of 6.5 pounds. And its beautifully designed exterior body gives a stylish and elegant look into your room. If not matched with your wall color or room’s deco, you can also paint the grilles as you like it. The performance of the sound of this speaker is so bright and crisp. The audio is balanced, and the dialogues are perfectly audible. You can feel the music, and you will sense like the characters of the movie are into your room. The bass and frequency responses are amazing, and to boost the lower frequency; you can also attach a subwoofer. The rate of the impedance of this speaker is 8 ohm. And its rating is 5 out of 5 stars, you can see it on Amazon. Only at 30% volume, you will experience a tremendously loud and crisp sound which is enough to enjoy your audio of all genres. Although it is expensive, it has all the features a good quality speaker should have. Apart from its high price, it is people’s best choice, and they prefer it to watch movies. You can order it online from Amazon at a reasonable price. Usually, you have seen a single set of speakers or in a pair, but it is the best in-wall speakers set in which five speakers are available. This 2 –way speaker is the best choice if you want to make a home cinema, your movie nights will be so realistic that the guests will not like to leave. Each speaker has a power of 20 to 200 watts. It has the best frequency response of 45 Hz to 22,000 Hz which is audible even at a low volume. This speaker also consists of the efficiency of 95dB and the impedance rate of 8 ohms. The size of its woofers is of 5.25 inches, and the polypropylene cones have high rigidity. The woofers combined with the soft dome tweeter of 12 mm gives the perfect loud and crisp sound. The deep bass enhances the quality of the audio the sound delivery is distortion-free. The speakers are weatherproofed and can be installed outside in patios or poolside bars as well as use it inside in the saunas or spas. The dimensions of the body are 7.7 x 3 x 7.7 inches, and it is the lightest weight speakers as compared to all of the ones mentioned above. Its weight is only 2.25 pounds. Its integrated wall-lock mounting system makes it immensely easier to install. 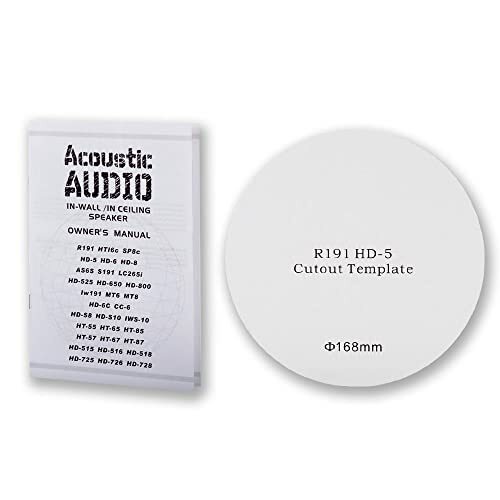 Cutout templates are present in the package, and the cutout size of each speaker is 6.625 inches, and the mounting depth of each speaker is 3 inches. The grilles are paintable, so color it of your choice. You can use these speakers for various purposes and applications such as home theatres, pool decks, garden areas, kitchen, bathroom, yachts, boats and much more. You can purchase it online from Amazon. Monoprice speaker can be used in 3 ways. It has the best bass performance due to the DuPont Kevlar fiber cone drivers. These drivers deliver the sound with absolutely no distortion. The pivoting titanium silk dome tweeters produce clear and detailed audio, especially of the dialogues and vocals. You can use it in the home theatres system to get the perfect stereo sound that surrounds in every corner of your home. The power handling capability of these speakers is 200 watts for one pair. The speaker has an adjustable crossover switch due to which you can paint the grilles to match your room decor. It takes less time and fewer tools to install it. The tools you need are marking pencil or pen, drywall cutter, stud finder, Philips screwdriver, wire strippers, 14AWG CL2 in-wall rated speaker wire (P/N 16083). The woofer consists of Kevlar woven cone of 9 inches with a rubber surround and a magnet of 30 oz. And the midbass has 3 inches of Kevlar woven cone, a rubber surround, and a magnet of 5.4 oz. The sensitivity level of the speaker is 90dB ± 2dB (0.1m/2.83V). The product dimensions are 14.9 x 11.5 x 9.7 inches whereas the cutout dimensions are 12.8 x 8.7 x 3.6 inches. However, the weight of the speaker is a bit heavy; it is 17.47 pounds. The users highly recommend this 3-way class speaker due to the high-quality bass in affordable prices. You should also give it a try. Order online today from Amazon and enhance the quality of your favorite music and movies. 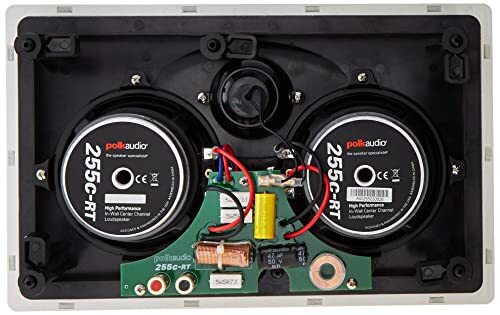 Polk Audio 265-RT speaker vanishes into your wall. It gives the clutter-free and clean look after fixing into the wall. You can color the outer grille of your choice and make it adjustable and matched with your home decoration. This 3-way in-wall speaker produces the loud and crystal clear audio with deep bass giving you the perfect cinematic experience at home. It also possesses Polk’s Power Port technology. The dual mid/woofers are 6.5 inches and a dome tweeter of 1 inch. It delivers distortion-free sound and can be used with various home theatres systems like 3.1, 5.1, 6.1, and 7.1 channel systems. It is effortless and easy to mount and install; the rotating cams help a lot in installing or establishing the speakers with no vibration. The frequency range is 30 Hz – 27 kHz; the impedance rate is 8 ohms. Along with its stylish design, it has the perfect size of the body, the dimensions of the product are 23 x 10.8 x 12.8 inches, and the speaker weighs for about 10.3 pounds. It is the perfect in-wall speaker if you want to make your movies look realistic. You can purchase it in reasonable price from Amazon. Q. Can I use the same type of speakers in every room? A. The answer is a big no. Every room needs a different type of in-wall speaker. If you are using it in the living room or where you watch movies, then you must go for something very loud and outstanding quality. But if you want to install it into the smaller rooms other places like kitchen, bathroom or sauna, then you can go for a little bit low quality, but the sound must be distributed evenly to every corner. But always keep in mind that if you use speakers outdoor or in a humid place like bathrooms or saunas, then still buy the water-resistant and weatherproof in-wall speakers. Q. What is the difference between the in-wall, freestanding and in-ceiling speakers? A. The in-wall speakers are mounted into the walls. They require no space into the room. They just perfectly goes into the walls with no clutter of wires; the wires are connected into the wall behind the speaker. It is a clean and best way to have a stereo sound with no mess. The freestanding speakers require more space in the room; they can be moved from place to place but have wires that can create a bit messy. They are usually heavy. And the in-ceiling speakers are mounted on the ceilings just above the ear level or the seating area. But they are too high. Q. What are the best sizes of in-wall speakers? A. Always remember that how good quality small speakers you buy but the large sized-speakers are usually the best in-wall speakers to produce a loud sound. But the size of the room also plays a significant role in the loudness of the sound or music. If the area of your room is 15 by 20ft, then you should buy a speaker of 6.5 inches. However, the 8-inch speakers are the best for the more prominent places and produce excellent quality sound with high bass performance. Q. Do I need Subwoofers for home theatre system? A. If you want to install the in-wall speakers for your home theatre system, then you should need subwoofers. It will enhance the volume and the quality of the sound giving you a real feel of the scenes. Make sure that when you buy the subwoofers for your in-wall speakers, they should be 2 or 3 inches bigger than the front speakers. Q. Is there a need for an Amplifier? A. The need for an amplifier depends upon the location of the speaker and the size of your room. The amplifier or intensifies the musical signal and makes the sound louder. You have to ensure that where the amplifier or amp will fit into your system. And keep it in a place where there is a proper flow of air; otherwise, it will heat up. Q. How can I play music in an in-wall speaker through my computer? A. You need a stereo receiver or an amplifier that boost the signal coming from the sound-card of your computer. And you need an adaptor to link it to the network or computer. Usually, a 1/8 inches 2-Male RCA adaptor is used for this purpose. Now, we hope that you have understood all the pros and cons of the in-wall speaker. Now you know what features you should see before buying these speakers? How can you install it? 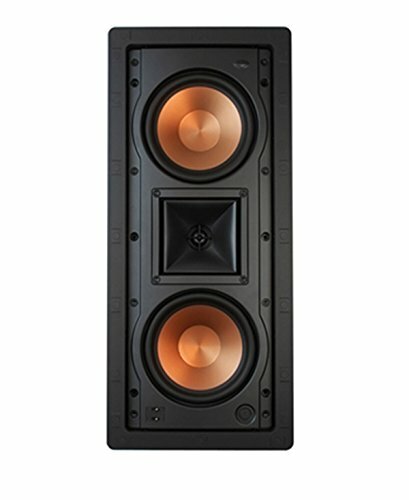 What are the price ranges of these speakers? Which speakers have the best sound quality? And most importantly you have the 10 best options in front of yourself, and there would be no confusion left in your mind about their best features. Always keep in mind these features before buying an in-wall speaker. And now you even don’t have to move out of your house or take time out of your busy schedule to go out in the market to first search the vast range of speakers and then buy it. Just read the features and pros & cons written above in the description of each speaker and immediately order it online. So, if you want to install the in-wall speakers into your living room or in the bathroom, kitchen or even outdoor, you have the list of these ten best in-wall speakers of 2019 with all the fantastic features that will enhance the quality of the sound and make your music, games, shows and movies so real. So, what are you waiting for now? Just choose the speaker that fits perfect according to your needs and order it online today!